Cute game, it was fun. Adventured to first town, fought a few baddies on the way there before giving some of my starter items to a local Elementalist. He promptly joined me on my adventure. On our way to our next quest, I found a pear tree and started plucking away. After eating the pears, I accidentally hit Z which caused me to use "/eat 7" and 7 happened to be a stick. My companion then proceeded to clobber me to death with his flaming enchanted mace. I didn't even have a chance to draw my axe. TL;DR Got clubbed to death by my only friend. 11/10 would die again. It was fun enough to keep me engaged for longer than I wanted to be, which is perfect for mobile games. I could see this being successful if you just had a banner ad or something non-intrusive, and made it a free game. Finally Finish Something 2019 community · Replied to pfail in Share Your Progress! Finally Finish Something 2019 community · Replied to Dominik Madarász in Share Your Progress! Man I was such a big fan of SAMP, I spent a couple hundred hours on some of the servers on that game. There were some RP servers that had like full gangs, businesses run by those gangs, and entire economies. It was pretty cool. You could buy businesses like car dealerships or gun stores and passively make money whenever other players bought stuff from your store. Hey everybody, my name is Aaron, and I'm the sole developer from Asperity Games. I generally go by the screen name Artarda; you might see me on Discord or Reddit. I am currently working on a game for the Finally Finish Something 2019 Game Jam, a project called Delve that's been shelved for years. I do all my developing using MonoGame C#, and I use GIMP as my sprite/image editor. I joined itch.io after determining using a game jam would be the perfect opportunity to motivate myself to finish a project! As a game lover myself, I hope once my game is uploaded that it's enjoyable to play! I personally have not, but I'll totally look into it! If you want to keep up with my development progress, our website's where I will be spamming updates with descriptions of what is getting done, screenshots of the work in progress, and general information on gameplay as it's updated! You can also like our Facebook page, but the website's where the majority of updates will be. Finally Finish Something 2019 community · Posted in Share Your Progress! This is actually going to be Asperity Games' first ever distributed game! Been making games on and off since 2013 as a single individual, and this game is actually the first concept I had before scrapping it in 2014. 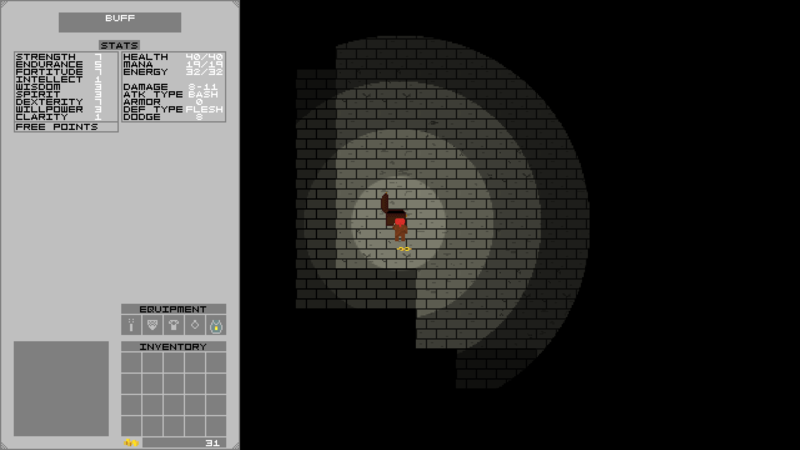 The game is called Delve and its a roguelike, souls-lite dungeon crawler. The gameplay consists of slaying monsters, looting chests, and delving ever deeper into the dungeon while keeping the darkness at bay. Anyone interested can keep up with our development blog on my website, Asperity Games, where I'll be posting regular updates on the progress of the game. Programming this game has been a blast and the game jam has given me a lot of inspiration to finish it. It's written in MonoGame C# and should run on anything Windows Vista and newer.